Our family of 6 enjoyed the Mountain River Cabin for the Great American Eclipse of 2017. We were extremely lucky to have clear skies for the total eclipse. It was so peaceful and breathtaking. We loved grilling out and exploring the local area. The lady's I talked with were very friendly and met out of their way to meet our needs. Thank you for such a nice place to stay. It was great for us. Nice and quiet for a getaway. Hot tub and porch and view are great. We appreciate staying her and hope to come back again next year. It was a great! Enjoyed hearing the little birds chirping. It was very comfortable. My husband and I really needed this getaway. It was wonderful to have coffee on the screened in porch and relax in the hot tub at night. Thank you for sharing your cabin with us. Awesome sums it up. Perfect getaway for my wife and I. We surely needed it. So much to see and do. So nice to come home to this cozy cabin. Can't wait to return. What a wonderful mother/daughter retreat! the cabin was perfect in every way! Thank you for allowing us to stat in this beautiful cabin. The follow up call on the day of check in is a nice touch. Excellent service with members of the team. Responded quickly and knowledgeable of properties. Thanks so for having us this week in your adorable little cabin. We thoroughly enjoyed the morning views and late nights in the hot tub. Getting away in the mountains is our favorite trips. But your cabin stands out the most. It is a nice cute cabin. It was a beautiful view and had very fun activites. The city is amazing and really fun!! Hopefully we can come back soon. Had the most fantastic 4 days here. From the Beautiful cabin to the beautiful mountains. Loved the Hot tub, horse back riding and hiking. This little cabin was the perfect getaway for us. The hot tub and screened in porch are something that we don't have. So we really enjoyed those. The views here are amazing wish we could stay longer! Thanks for having such an awesome place to stay in. This was a unplanned trip, they were very helpful in getting everything arranged for our arrival. We enjoyed our time here. Lots of things to see and do. Hope to stay longer on our next trip. Even though the weather didn't fully cooperate with us, we had a great time at this cozy cabin. The views are spectacular. 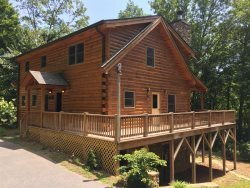 The cabin is perfect for our family. We are already planning on a return trip. Thanks for opening up this cabin to share. We loved it. Great staff, want to satisfy their client. Enjoyed stay.